A Peruvian Black Market in Human Fat? A medical expert at Peru's Medical College said on Friday that he found it highly unlikely that a gang of murderers could have been exporting their victims' body fat for thousands of dollars, as was alleged by police. Julio Castro, Dean of Peru's Medical College in the capital Lima, said it was currently easy to obtain human fat through plastic surgery procedures such as liposuction, so he could not understand why anyone would be prepared to pay exorbitant prices. "It doesn't make sense that the (body) fat would be sold at prices of US$15,000 dollars a liter," said Castro. "Hundreds of liters of human fat are obtained every day at cosmetic clinics, and disposed of," he added. Peruvian police made the claims on Thursday that a criminal organization had been selling the human fat for thousands of dollars. Police said a gang in the remote Peruvian jungle had been killing people for their fat, draining it from their corpses and offering it on the black market for use in cosmetics. A spokesperson for the Criminal Police told a news conference in Lima that the criminal organization which trafficked human fat had been disbanded. Pictures from a Peruvian police handout video showed police in Huanuco province leading suspects to the spot where they allegedly buried their victims, and unearthing and measuring buried remains. AP Television cannot independently verify the content of the Peruvian police video or the authenticity of these claims made by Peruvian police. Julio Castro, Dean of Peru's Medical College said that human fat had some medical purposes. "It can be used in implants, but the fat implanted must be that of the same person undergoing the procedure," he added. A professor of plastic surgery at the University of Virginia medical school was skeptical when told about the Peruvian ring. He said he could not see why there would be a black market for fat because in most countries fat can be obtained so readily and in such amounts from people who are willing and ready to donate it. 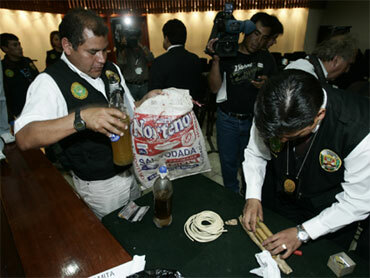 Peru's police chief of anti-kidnapping said three suspects had confessed to killing five people for their fat. He said the suspects, two of whom were arrested carrying bottles of liquid fat, told police it was worth US$60,000 a gallon. He said the suspects told police the fat was sold to intermediaries in Lima. While police said they suspected the fat was sold to cosmetic companies in Europe, Peru's police chief of anti-kidnapping could not confirm any sales. He said police received a tip off four months ago that human fat from the jungle was being sold in Lima. The three are charged with homicide, criminal conspiracy, illegal firearms possession and drug trafficking, according to a statement from Lima Superior Court. Police said they were searching for the alleged buyer.